NINA'S CUPCAKES- Cupcakes come with your choice of icing. Frosting can be dairy and egg free on request, most cakes are available dairy and egg free with a flavoured frosting. 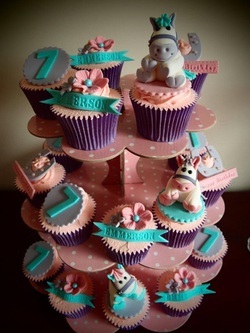 Each cupcake includes one cut out design, such as a flat heart or single flat number ,at the basic price. The more intricate the decorations the higher the per cupcake cost. It is possible to mix the intricacy of frosting designs in a single order, per dozen ordered. For example 2 doz. with a single flower, and then 1 doz. made up with more intricate designs, once mixed up on a cupcake stand, the result is always amazing. Basic range starts at $3.5ea, this range is more suited to childrens party, as most mums know, children often just eat the frosting, 2 doz packaged $92. Premium range starts at $4.5ea, 2 doz packaged $116. CUPCAKE TOWERS - Are best made up of a mix of different styles , this works well too if you are on a budget, for example: 1 x Cupcake Topper @ $12.5 , surrounded by 12 with a single flower at $3.5 ea. The remaining 11 in a more intricate style at $4.5 in the basic flavor range makes 24, boxed , all for $121. Prices are variable and reflect the designs chosen. ORDERING NINA'S CUPCAKES - Minimum order is 2 dozen- then by increments of 6, ie 2 and a half doz, 3 dozen, 3 and a half etc. For deliveries a 2 doz. minimum is required. Quotes are valid for 7 days, a 50% deposit is required to secure your booking, and balance paid in full 7 days prior to event. Cancelled parties forfeit deposit. DELIVERY - Free local delivery in Pakenham area subject to availability, cake deliveries outside local area incur small delivery fee.